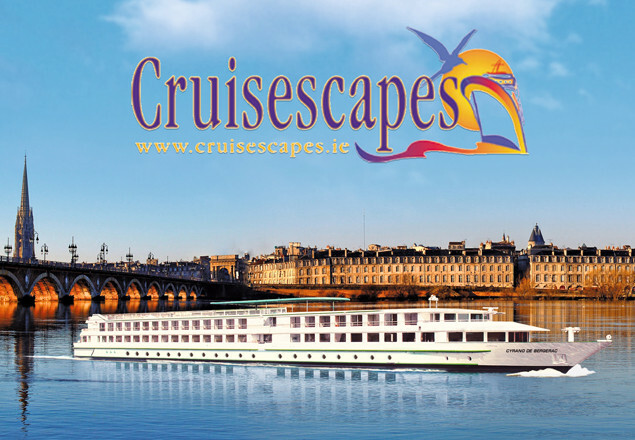 In another exclusive offer, Cruisescapes has teamed up Rewarding Times, with an all-inclusive 5 Anchor Bordeaux River Cruise for two people. Departing on October 5th and flying direct from Dublin to Bordeaux, visit the largest area of AOC vineyards in the world, the hidden and unusual heritage of Pauillac and the Médoc with their renowned châteaux. We also visit the medieval city of Blaye and its renowned wines, Saint-Emilion and of course Bordeaux, listed as a UNESCO World Heritage Site. On arrival you will be transferred to the port for boarding. Welcome cocktail and presentation of the crew. Dinner followed by a guided tour of Bordeaux by night. A UNESCO World Heritage site, Bordeaux has been awarded the precious label in the "cultural site" category. Half of the city, from the boulevards to the banks of the Garonne has thus been recognised for the quality of its architectural heritage. Departure by coach for a panoramic tour of the city, taking in all the main monuments, followed by a walking tour of old Bordeaux. From the wide avenues of the neo-classical Les Quinconces quarter and the Grand Théâtre to the narrow lanes of the Saint Pierre quarter, this circuit will give you a good idea of the diversity of Bordeaux's heritage. Early in the morning, cruise to Pauillac. We will head down the Garonne River and then join the Gironde River, passing Cazeau Island and Patiras Island before arriving in Pauillac. In the afternoon, excursion to visit the Medoc. A corner of the world that produces the most prestigious red wines on the planet, tightly wedged between an ocean and an estuary. A mild, humid microclimate which has been favourable to the development of the vines. We will go through most of the Médoc appellations (Saint Julien, Margaux, Haut-Médoc…). On the famous Châteaux Road, we will stop in one of them to taste the famous wine of the region. On the way you will see the major names of Châteaux Laffitte-Rothschild, Latour and Mouton Rothschild. Return to the boat at the end of the afternoon.Evening of entertainment provided by our crew. Early in the morning, cruise to Blaye. Arriving in Blaye, this superb acropolis was the perfect look-out post to watch for invaders. The famous French military engineer Vauban built a citadel here, which is Blaye's undisputed major attraction today. Excursion along the Corniche. Narrow and picturesque, it runs alongside the Dordogne and then opens out onto the Gironde Estuary. You will see pleasant gardens, old fishermen's houses, remarkable houses nestling in the cliffside and the famous "carrelets", the curious fishermen's cabins perched above the water. Unusual scenery with a mixture of river, stone and vineyards. There will be a short stop in Bourg, a delightful village built on a rocky outcrop surrounded by medieval ramparts. After that, return to Blaye to visit the Citadel. Imposing and majestic and listed by UNESCO as a World Heritage Site it overlooks the Gironde estuary and offers a splendid panorama of the river. Return to the boat. or cliff route. Return on board. Evening of dancing. Full board on board. Start cruising towards Libourne. Excursion to Saint-Emilion and wine tasting. Guided tour of the underground monuments in Saint-Emilion village. Your guide will present the history of the medieval town. You will then see an exceptional troglodytic site: the cave of the monk Emilion founder of the town, Trinity Chapel built in his honour and the catacombs. Finally, undoubtedly the most original monument, the Monolithic church. Hewn entirely in the limestone, it is the biggest in Europe. You will then depart for a visit of a family-owned wine-growing estate, where you will be welcomed by the owner, who will explain the stages of the wine-making process in Saint-Emilion. A wine-tasting session with commentary will complete the visit. Return to Libourne by coach. Gala dinner and evening. Buffet breakfast on board. Cruising towards Bordeaux and arriving later in the morning. Disembark at 11.00 a.m with your return transfer to the airport for your homeward flight. Unlimited complimentary onboard beverages, including beer, fine wine, spirits, mineral bottled water, soft drinks, specialty coffees and tea. Purchaser of this offer should call immediately to book with Cruisescapes as cabins are limited.